Punt, Pass & Pork: Big 12's lack of a true champion proves costly in the College Football Playoff selection committee's final rankings. GRAPEVINE, Texas -- Big 12 commissioner Bob Bowlsby got screamed at Saturday night by a coach to whom he had just presented a championship trophy. Then Bowlsby navigated his way back up Interstate 35 to his suburban Dallas home. He slept a few winks, and he caught a plane to New York. That’s where he was on Sunday when his league got gut-punched. Bowlsby’s weariness bled through the phone as he tried to explain how the Big 12’s policies, its refusal to adjust and its misguided ad campaign cost the league a chance to participate in the first College Football Playoff. The Big 12, which touts itself as the league that crowns “One True Champion,” crowned co-champs. 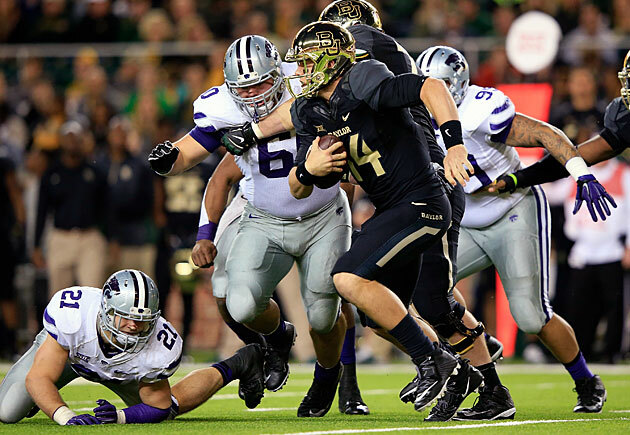 Baylor and TCU each went 8-1 in league play and 11-1 overall. They were each named the Big 12 champ and given a trophy. Then both were left out of the playoff. Now the Big 12 has an offseason to figure out what, if anything, it should do about that. In part because a Big 12 champ (Oklahoma State in 2011) was excluded from the BCS title game in favor of the SEC West runner-up (Alabama), the conference commissioners who designed the playoff ordered the selection committee to consider a league championship a key criterion. The other Power Five conferences crown a single champ. There can be no doubt as to who won the Big Ten. It's Ohio State. Oregon won the Pac-12. Florida State won the ACC. Alabama won the SEC. Who won the Big 12? The committee was left to decide for itself. We reporters pressed Long more, because while he said at the outset that Ohio State was a "decisive" No. 4 and the co-champ factor had nothing to do with the Big 12 snub, nothing else he said seemed to match that. He kept referring to the fact that Ohio State's extra game against a quality opponent tipped the balance between the Buckeyes and Baylor, which finished No. 5. He kept remarking that the four teams that made the playoff won conference titles. So, the notion that the Big 12 couldn't present a champion had to hurt the Bears and Horned Frogs. It might not have been the only reason the Big 12 got left out, but it had to weigh heavily, otherwise Long wouldn't have brought up those factors the way he did. How were the two Big 12 contenders considered? “They were weighed as co-champions," Long said. What does that mean? Long wouldn't specify, but it's pretty obvious that neither was given the benefit of a "conference champion" line on its résumé. For that, blame the Big 12. The league had every opportunity to clarify which team was its champ, because, make no mistake, only one won the conference. When two teams have equal league records and had a head-to-head meeting, the winner of the head-to-head wins the title. Anyone who has ever played a team sport knows this. Baylor, which beat TCU 61-58 on Oct. 11, won the Big 12. That is not up for debate. So, why didn't someone from the conference office say that and allow the Bears to enjoy the bump? Why would the Big 12 do that? Is it run by a bunch of participant ribbon-loving head-patters who don't want any team to feel less special? Probably not. Why would coaches and ADs want co-champs? Well, because coaches and ADs have clauses in their contracts that provide them with more money if their teams win championships. More championships handed out means more bonuses paid. Unfortunately, the funding for a coach or AD's new man cave might have cost the league a shot at the national title. It has turned a solid football conference into an object of ridicule. Why did committee members think the Big 12 would present one champion? Because on July 21, at Big 12 media days, Bowlsby said it would. “We’re always going to apply a tiebreaker to determine who our champion is, because we have to put forth a representative to one of the bowl games," Bowlsby said in July. "So even though the records may be exactly the same, there's either a head‑to‑head competition with the same record or there's a tiebreaker imposed. So we always are going to get to the point of a true champion." On Sunday Bowlsby said he "misspoke" in July. If that's true, the league looks even worse for building a branding campaign around that "One True Champion" phrase. Maybe "Two Sort-of Champions" would’ve been more accurate. The other possibility is Big 12 leaders consciously avoided naming one champion because they hoped it would help get two teams into the field. And had Florida State and Ohio State lost on Saturday, that gamble might have worked. But now the league must stand on the sidelines and watch its peers participate in the playoff. The reasoning behind the branding campaign was solid: The Big 12 has only 10 members, so its teams play a true round robin in football. This is a far better set-up than the other Power Five leagues, where a good or bad interdivisional draw or a good or bad day in a conference title game can make or wreck a season. The Big 12's system relies far less on scheduling chance. The best team usually wins the league. But that only works if conference leaders have the guts to actually declare their champion a champion. The question is whether the Big 12 was penalized for not playing a championship game or for not declaring a clear champion. It could have fixed the second issue. The first is a bit thornier. After getting pillaged during two rounds of conference realignment and nearly imploding twice, the Big 12 didn't expand back to 12 schools because there weren't two schools that would convince TV partners to pay enough to keep the league's per-school revenue share at its current level. If adding BYU and Cincinnati or UCF and USF would guarantee that payday, the league would’ve already expanded. This is important because the NCAA requires leagues to have at least 12 teams and two divisions to stage a championship game. The rule, like so many in the NCAA, is completely arbitrary, but it's still in force. The Big 12 and ACC -- the latter of which wants to get rid of divisions but keep its championship game -- proposed scrapping the rule in May. It may be eliminated this offseason. Then Big 12 presidents and ADs would have to decide whether they want to pursue a championship game. Such a game would be lucrative -- at least $1 million more per school, and that's a very conservative estimate -- but could be awkward considering Big 12 members already play that true round robin. “If we have a championship game, it would be between two teams that had already played each other," Bowlsby said. Bowlsby, who was Stanford's AD when the Pac-12 created its championship game, should remember that Arizona and Oregon played on Oct. 2 and then again on Dec. 5. The republic still stands. Another potential option is to push for an expanded playoff. “The fact that we’re unhappy doesn’t mean that the process is flawed," Bowlsby said. "Will it facilitate perhaps conversation about expanding to eight? Those conversations are already going on." Don't get too excited. Bowlsby said later that he was referring to the conversation in the media and among fans. He said there have been no internal discussions about a desire to expand the playoff field. Big 12 athletic directors will meet on Monday in New York. The last time they met in a situation when they were this mad, it resulted in a stake being driven through the BCS’ black heart. Will they make a significant change this time? That's tough to say. The selection committee won't offer any advice on the champion issue. 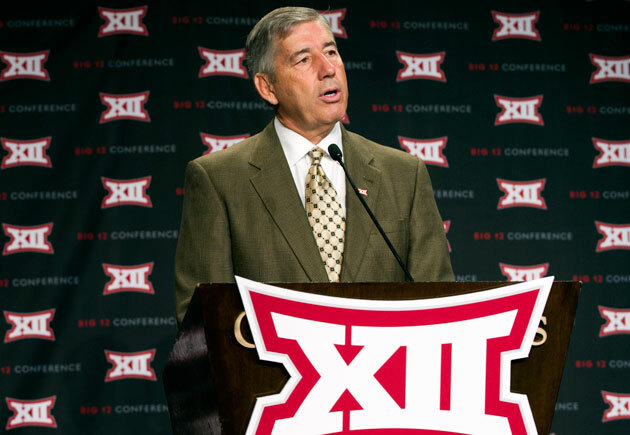 “I can’t answer what’s best for the Big 12 conference," Long said. "That’s not for us to decide. I can’t answer that. That’s for the Big 12 to decide." Or maybe the committee, through its actions on Sunday, has provided all the advice the Big 12 needs. The lack of college football means we'll have to find something else to watch. Fortunately, it's December. It's socially acceptable to play National Lampoon's Christmas Vacation on a loop. We can all agree that Christmas Vacation is the best third installment of a movie series ever made. If we can't, then we simply can't be friends. Here are the top five threequels of all time. 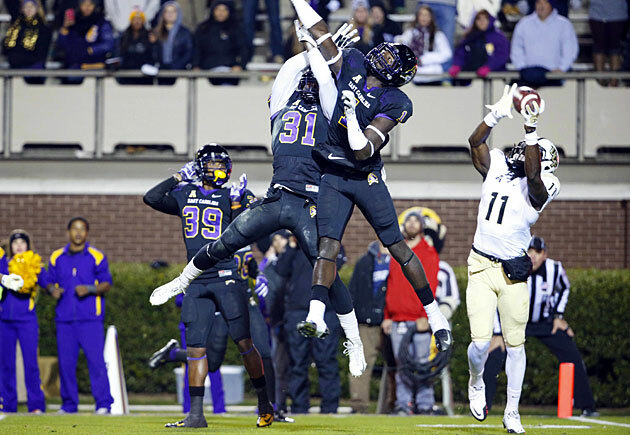 By now you’ve seen the incredible Justin Holman-to-Breshad Perriman Hail Mary that lifted UCF over an East Carolina team that had scored 21 consecutive points to take a late lead. But have heard the incredible Justin Holman-to-Breshad Perriman Hail Mary that lifted UCF over an East Carolina team that had scored 21 consecutive points to take a late lead? It’s even better as an auditory experience. Oregon avenged its only loss of the season and won the Pac-12 title game by smothering Arizona’s offense. The same guy was in the backfield seemingly every time a Wildcats’ play failed. DeForest Buckner, a 6-foot-7, 290-pound junior from Waianae, Hawaii, led the Ducks with seven tackles, including one sack, but his impact was even bigger than that. With Buckner disrupting almost every play, Arizona failed to move the ball consistently. Or move the ball at all. 1. Baylor coach Art Briles was mad at the Big 12 on Saturday for not presenting the Bears to the selection committee as the league's champion. After getting snubbed on Sunday, Briles suggested the committee needs more Southerners. I would attempt to summarize, but I couldn't do it justice. Here's the whole quote. “My opinion since people are asking -- I think the committee needs to be a little more regionalized with people that are associated with the south part of the United States. I'm not sure there is a connection on there that is that familiar with the Big 12 Conference. To me that's an issue. We are all humans. When I die they are not going to bury me in Maryland. They are going bury me in Texas. When those people die they are not going to bring them down here and lay their body to rest. They are going to lay them to rest where they have lived all their life, and teams they've followed and teams they know. You want to ask me about a team in this part of the United States, I can tell you about them. I can tell you their weakness and their strengths. They need to have somebody on there that knows the teams in this part of the nation. The only person born in the South on that committee is Condoleezza Rice. She was born in Alabama. When Archie Manning went off, I said, ‘We're in trouble.’ I know Archie. He is a friend. He understands football down here. When he went off that committee, we were in trouble. We need a voice. We need a voice. Big 12 champions, Michigan State, Cotton Bowl, Baylor Bears." There is one big problem with that statement: There are no Big 12 teams in the South. Texas is not part of the South. Texas is Texas. This is one of the few things upon which Texans and Southerners can agree. Also, Alabama's Nick Saban didn't seem to have any issue with geographic balance on the committee, and Alabama is actually located in the South. 2. One of the biggest issues with Sunday's movements in the rankings was TCU dropping from No. 3 to No. 6. Long said all along that committee members started with a blank slate every week, and he wasn't lying. With the résumés complete, Baylor's head-to-head win suddenly became the deciding factor between the Bears and the Horned Frogs. This was how the process was supposed to work, but it was understandably confusing to people because the same committee had ranked TCU No. 3 the previous week. This is why the weekly rankings were always a bad idea. On Sunday Long was asked if those weekly reveals will continue next year. Long said committee members would evaluate the process and make recommendations to the playoff management committee, which would ultimately decide. “It’s up to the management committee how the process will change -- if it will change," Long said. Translation: Don't expect the weekly rankings to go away. ESPN, which pays a lot to televise the playoff, wanted a weekly TV show. It got a very successful one. 3. Let's cease the hand-wringing for a moment and consider something. On Jan. 1 Alabama will play Ohio State in the Sugar Bowl and Oregon will play Florida State in the Rose Bowl. The winners will play one another on Jan. 12 at Jerry Jones' Football Emporium and House of Chicken and Waffles. How awesome is that? 4. The Coaches’ Poll doesn't mean anything now, but that doesn't mean we can't take a close look at the final ballots. Briles voted Florida State first, Oregon second, Baylor third, Alabama fourth, TCU fifth and Ohio State sixth. TCU's Gary Patterson also voted the Buckeyes sixth, but he voted the Horned Frogs No. 3. Saban's ballot perfectly matched the top six of the committee. Florida State coach Jimbo Fisher voted his undefeated Seminoles No. 1, followed by Alabama, Oregon, Ohio State, Baylor and TCU. Ohio State’s Urban Meyer nearly matched Saban and the committee. He transposed Oregon and Florida State. 5. The Sugar Bowl matchup will be the fourth between Meyer and Saban. Meyer's Florida team beat Saban's undefeated Alabama team in the 2008 SEC title game and went on to win the national championship. The next year Saban's undefeated Crimson Tide knocked off Meyer's undefeated Gators to win the SEC en route to a national title. In 2010, with quarterback Tim Tebow off to the NFL, Florida went to Tuscaloosa and got whipped 31-6 by Saban's team. 6. Florida State finished its ACC title win without defensive tackle Eddie Goldman and cornerback Ronald Darby, who left with injuries. Goldman was taken off on a cart, causing understandable concern. After the game Fisher eased those fears with some highly scientific medical terms. He told reporters the players suffered some “knicks and knacks” and would be back in time for the playoff. 7. The most intriguing non-playoff matchup may be Michigan State meeting Baylor in the Cotton Bowl. If the Bears truly want to be there, the match of Briles' offense against coordinator Pat Narduzzi's defense will be fascinating. 8. If the BCS still existed, Alabama would be playing Florida State in the national championship game. Ohio State would face Oregon in the Rose Bowl. Baylor would probably play Arizona in the Fiesta Bowl. Mississippi State would probably face TCU in the Sugar Bowl, and Memphis, UCF or Cincinnati would likely face Michigan State in the Orange Bowl. 9. Army-Navy will be the only actual college football game this week, but we won’t go any Saturdays without college football. Bowl season begins on Dec. 20 at 11 a.m. ET with the New Orleans Bowl, which matches Nevada and Louisiana-Lafayette. If you’re one of those I-walked-to-school-10-miles-through-snow-uphill-both-ways old-timers who wants to whine about too many bowls, stuff it. If you like football, you should like more football games. You’ll miss football when it’s gone in mid-January, so treasure these moments. 10. What are the two luckiest teams that didn't make the playoff? That's easy. Central Michigan and Western Kentucky. Those teams will face off on Dec. 24 in the first Bahamas Bowl. It's sponsored by Popeyes, which presumably means the teams will be provided with unlimited spicy marinated fried chicken. And they'll be in the Bahamas. They'll be staying at Atlantis. The rest of us are doing it all wrong. The College Football Playoff committee meets in a massive hotel in Grapevine called the Gaylord Texan. The location was presumably chosen for its proximity to the Dallas-Fort Worth International Airport and for the fact that it is so sprawling and bustling that an athletic director or former Secretary of State could blend into the crowd. It's the type of place designed to keep guests and their money on the property. It has an Italian restaurant, a steakhouse, a sports bar, a wine bar and various other ways to deliver the same stuff you can get at any hotel anywhere. Fortunately, there are a few decent places to eat nearby should the committee decide to venture off the property next year. One of those is Peace Burger. Situated in a strip mall next to two sister restaurants, Peace Burger appears to be a favorite spot for DFW employees to unwind after work. Its prices are decidedly downscale, but its ingredient list is impressive. Because of this, I assumed the burgers would be tiny. A large burger featuring chorizo, Monterey jack, avocado and onion strings runs at least $10 elsewhere, but Peace Burger sells the Macho for $5.99. It had to be tiny. That’s why I also ordered the Roadhouse (a patty topped with ham, Monterey jack, jalapenos and onion strings) and carne asada cheese fries. This horrified the bartender, and when the burgers arrived I understood why. They were close to a half-pound each, and Peace Burger doesn’t skimp on the other promised goodies, either. Meanwhile, the fries come swimming in queso cheese and surrounded by big chunks of carne asada. The bartender didn’t need to worry. 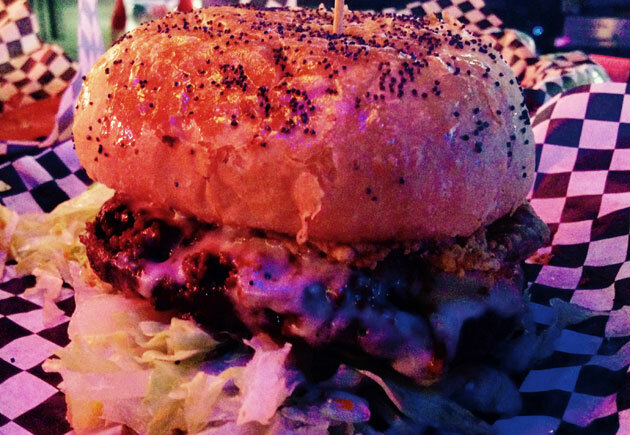 The burgers were juicy, and their toppings popped as the menu promised. The cheese was a little heavy on the fries, but given the volume of beer flowing from the taps, I’m not sure anyone minded. Peace Burger was a nice surprise in what I had assumed would be chain hell, but the best dining moment of the trip came in the wee hours of Sunday morning. USA Today’s George Schroeder and I had just finished writing about Briles and Bowlsby mixing it up on the trophy presentation stage in Waco, and we were headed back to Grapevine to catch a few winks before the committee revealed the final field. We were droopy, but we knew relief awaited 18 miles north on Interstate 35. The Czech Stop is a gas station/convenience store in West, Texas, that sells the usual stuff (gas, coffee, beef jerky) but also has a bakery case loaded with kolaches. What’s a kolache? It’s a flaky Czech pastry with a soft, pillowy interior that can contain fruit filling or, if you’re in a breakfast mood, egg and sausage. At the Czech Stop fresh kolaches are available 24 hours a day. 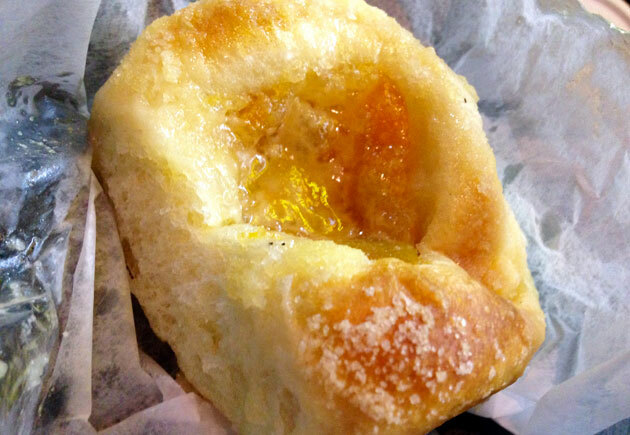 So, at 1:55 a.m. on Sunday, I ordered one hot peach kolache and one hot apricot cream cheese kolache. After watching the Big 12 eat itself, I was ready to eat something sweet. The kolaches, covered in sugar crystals and giving off steam, didn’t let me down. They never do. That’s the best part. 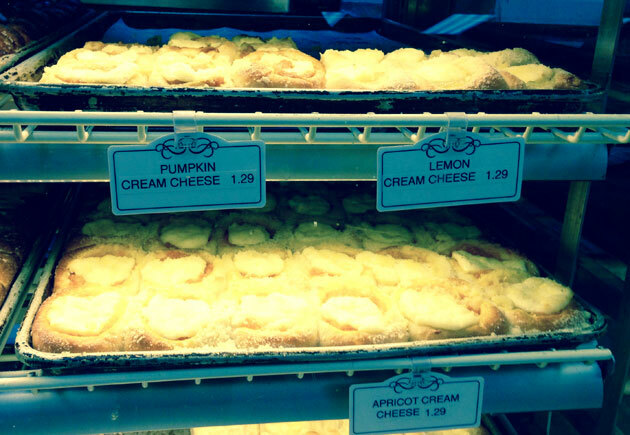 No matter when a weary driver rolls into the Czech stop, the music will be blasting and the kolaches will be waiting. All said driver needs do is choose a flavor, and the rest of the journey won’t feel nearly as long.